A Liberal's Libretto: 11 days and counting until Election Day. Cue: Shenanigans. 11 days and counting until Election Day. Cue: Shenanigans. Those of you who are frequent readers of A Liberal's Libretto know exactly how I feel about this year's election. In a nutshell (for those of you who aren't returning visitors) I believe that in order to help move our country forward, we must vote. Well, with 11 days to go until election day, the closeness of the election (by date and by poll) is quite evident given that there all sorts of shenanigans transpiring. A spokesperson for the Maricopa County Elections Department admits they once again gave voters the wrong date of next month's election. The Maricopa County Elections Department mistakenly listed the wrong date of the upcoming general election on an official government document. 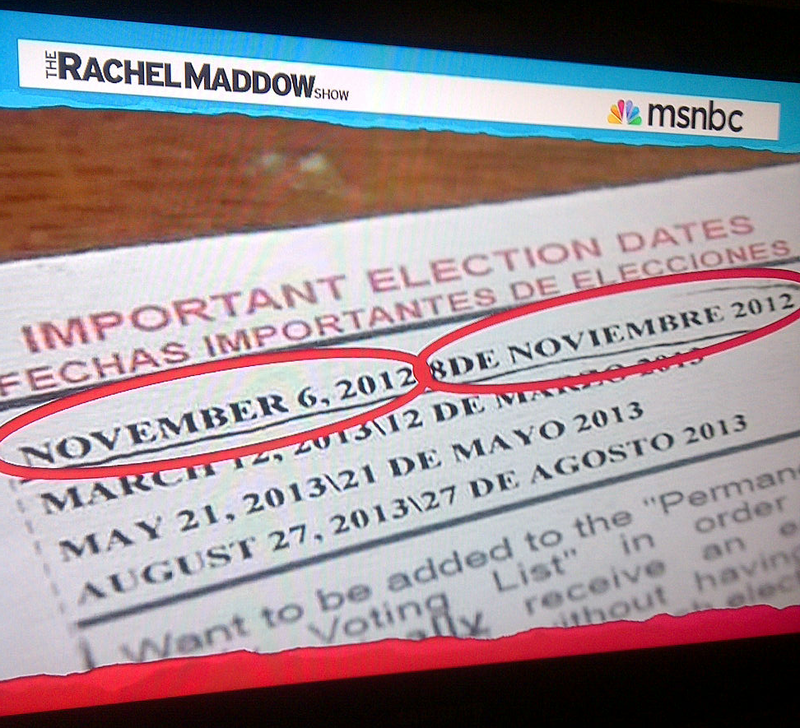 The error appears on a document containing a voter ID card. In addition to the ID card, the piece of paper it comes in lists other information such as important election dates. 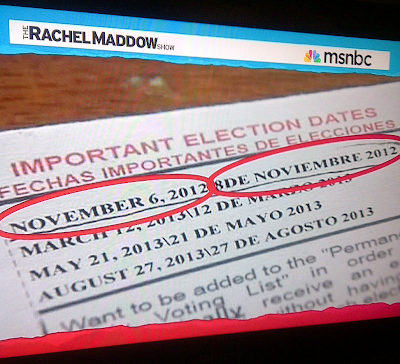 In the corner of the document, it says November 6th in English but in Spanish it reads 8 de Noviembre, the 8th of November. Hey there, Arizona ... we see what's going on. Your large Latino population, which favors President Obama, is being "accidentally" told to show up to the polls two days AFTER the election. We're not stupid. Wake up. The FBI and U.S. Postal Service agents are investigating bogus official-looking letters sent to voters in at least 28 Florida counties questioning their citizenship and their eligibility to vote, NBC News has learned. The fake letters, which first started showing up last Friday, have been sent under the names of real Florida county election supervisors -- with some correct contact information -- informing the voters that the supervisors have received "information" about their citizenship status, "bringing into doubt your eligibility as a registered voter." Chris Cate, a spokesman for the Florida Secretary of State's Office, told NBC News, "We believe these letters appear to meet the standard of voter intimidation." Between 50 and 100 such letters have been reported to state officials so far, "and those are only the ones we know about. We're encouraging people to come forward." Found it interesting that the back of the voter registration card dedicated two paragraphs about voter ID rules Texans would have to adhere by upon federal approval. At first glance, it appeared to me the voter ID law passed and would be enforced. Why else would they dedicate two paragraphs full of details on voter ID rules? I don't think I need to proceed any further ... let's be honest, it's not like I haven't discussed voter suppression and intimidation before. Right? Ladies and Gents, if you are of voting age and are a citizen of this country, you must vote. It is our fundamental right as Americans to participate in the election of our government. It is a key principle upon which our great country was founded. If you sit by and let nervous political gasbags corruptly muck-up your chances to take part in that vote ... if you allow them to bully you into not being allowed to cast your vote ... then, you have allowed them to adulterate our elections and you are, ultimately fulfilling somebody else's plan.